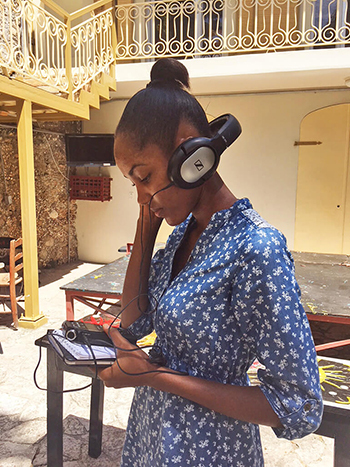 Between 17 and 29 September 2018, eight radio journalists got together in Jacmel, the capital of the Sud-Est department of Haiti, to produce reports on local issues. Over a period of two weeks, and with the support of two journalist-trainers (Stéfanie Schuler from RFI and Marc Kingtoph Casimir from Radio Kiskeya), they were able to improve their radio reporting techniques with a view to covering stories focused on local issues, the priority being to give citizens a voice. Such is the objective of the Info Toupatou	project, launched last June in Cap-Haïtien and aimed at promoting local news coverage in Haiti and at better reflecting the issues that matter to people in the editorial lines of radio stations both in the provinces and in the capital. Among the topics selected for the reports were the disappearance of mandarins in the commune of La Vallée-de-Jacmel, the professionalisation of fishing techniques in Cayes-Jacmel and the support of livestock farmers and dairy producers in the region. This training was held at the premises of Alliance française de Jacmel.